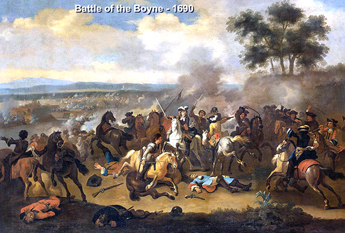 The genealogy of our Davison family begins in Northern Ireland in 1690 with the Battle of the Boyne, near our home town of Tandragee. (Click on pictures for large image). William III invaded Northern Ireland, easily defeating the army of King James. His Huguenot soldiers were mainly Belgian and French, while others were from Holland, England and Scotland. Our family history (passed on to present day Davisons in Tandragee) says that our ancestor was from Scotland in William's army, and that he was granted farmland around Tandragee (which was formerly spelled Tanderagee), in County Armagh. It is also possible that we came from Scotland during the British "Plantation" of Ireland in the 1600s. Our ancestor George Davison (who came to Canada in 1826) claimed to be of the Church of Scotland. Canadian family records say that he was a shoemaker in Ireland. The name Tandragee comes from the Gaelic "Toin re Gaoith", and means "backs to the wind", referring to the main street built on the side of a hill. It has had many spellings over the years, such as Tonerigee, Tawntaglee, and Tanderagee. The modern spelling is supposed to come from English servants who spoke "posh" and proper". 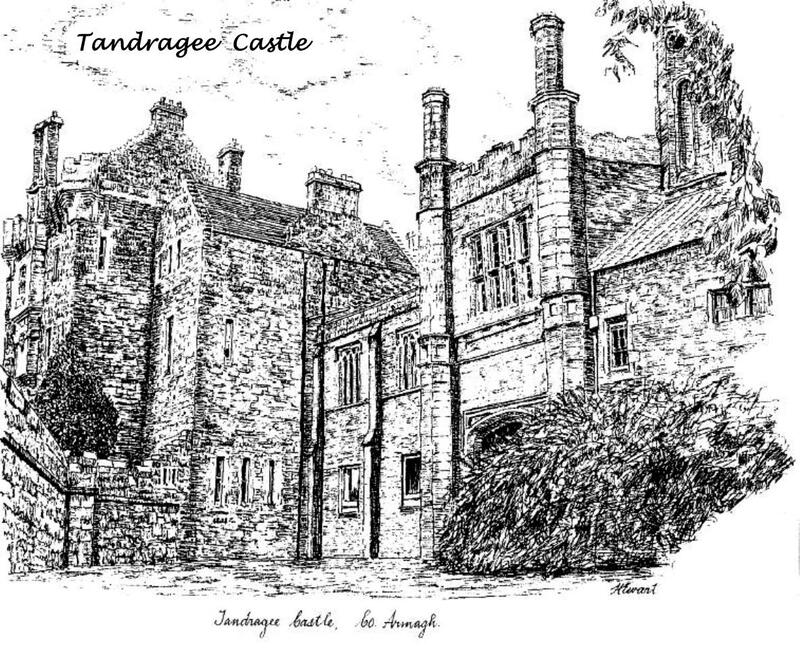 Tandragee's motto is "Tandragee No Pinch", which comes from the eighteenth century. 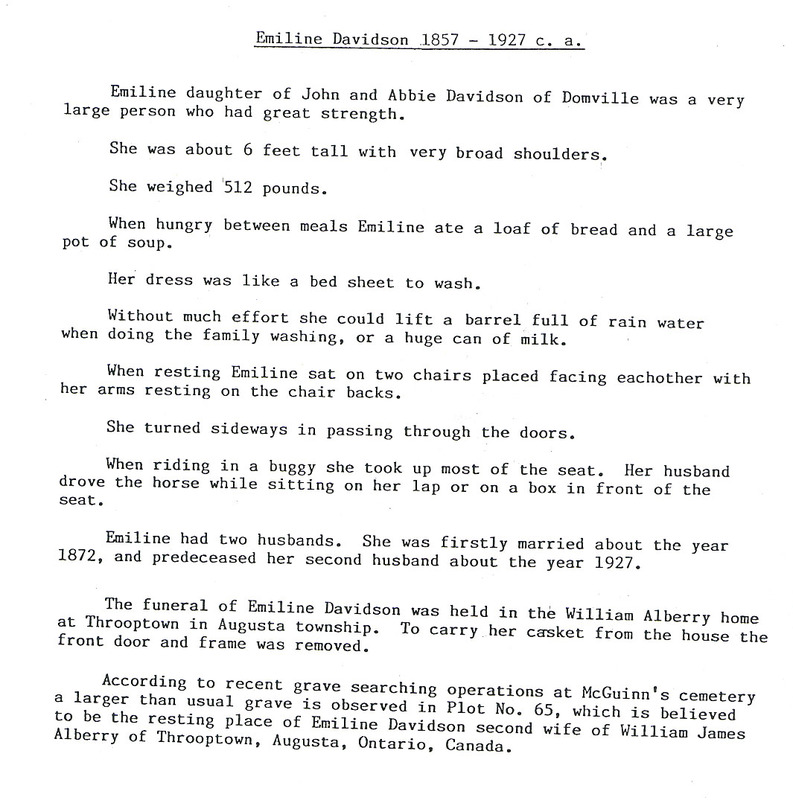 Times were good, and oats, potatoes, flax and cattle were presented in a fall fair with buyers coming from all over. There was plenty for all, and no penny pinching or saving was needed. 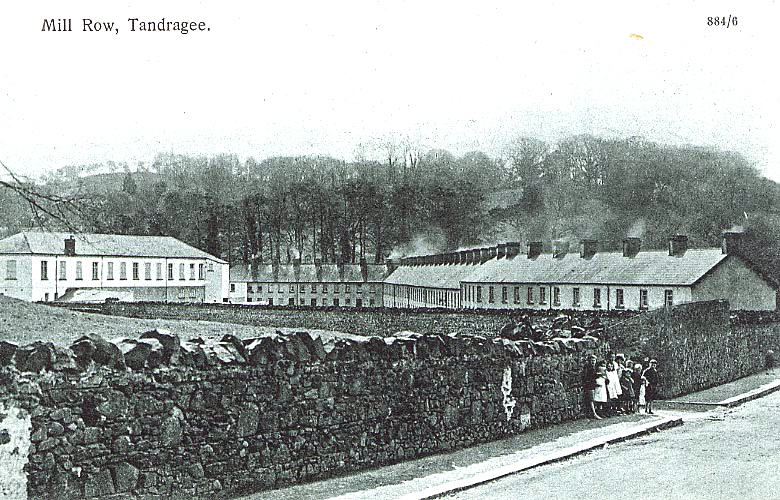 The area around Tandragee was known for production of fine linens. In 1805 Mr. J. Davis (Davison) introduced the manufacture of Damask, a fine woven blend of silk and linen. Four generations of Davisons, starting with John Davison in the early 1700s, were involved in linen production, and Mr. James Davison represented the area at area trade fairs and Linen Associations in the early to mid 1800s. It is likely that linen spinning and processing was carried out from the home building (49 to 53 Market St.) which was also a base for George Davison's cab trade. There were extensive flax mills, as well as flour, oat and corn meal mills on the Cusher River. A weekly market was the largest in the county, "with such busy crowds as to be astonishing to strangers". The linens and flax were considered the best in the kingdom. 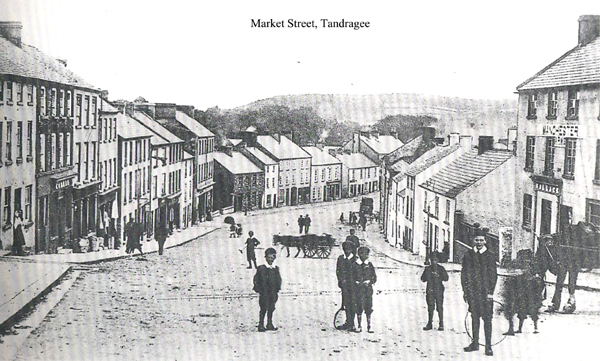 Tandragee is described in several publications of the time (1820, 1837). 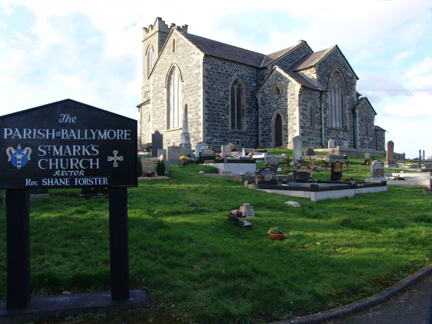 It is a market town in the parish of Ballymore, barony of Lower Orior, county of Armagh, province of Ulster. It is twenty four miles south-west of Belfast. One long wide main street dominates the town, with a market place at the upper end of the hill. It is very beautifully situated, sheltered from the prevailing winds by the fine trees. On the top of the hill, there is a long and very handsome public walk, overshadowed by a row of the finest lime trees in the kingdom. The river Cusier (today Cusher) passes through the lower end of the town. In 1819 the town consisted of 1200 people, of whom two thirds were Protestants. The mansion house, usually called the castle, was built on the site of an ancient castle on the hill. The original baronial castle was built by the O'Hanlons, who participated in a rebellion against Queen Elizabeth I. Because of this, the lands were forfeited to the Crown in the early 1600s, and were granted to Sir Oliver St. John, who peopled the land with English settlers. Viscount Mandeville rebuilt the castle in the early 1800s. Lord and Lady Mandeville became benefactors of the community, establishing an orphanage, three dispensaries, and 25 public schools in the area, each of which was attached to a lending library. A "moral agent" was resident in the castle, and he established loan and clothing funds. An annual festival took place at the castle, where all the children assembled (over 2000) and were entertained by Lord and Lady Mandeville. (Refs. 1 & 2) The castle is now a Tayto Crisps (potato chips) factory. In the 1600s and 1700s times were difficult for the resident Irish, who were displaced by many "planters", brought in from England and Scotland. 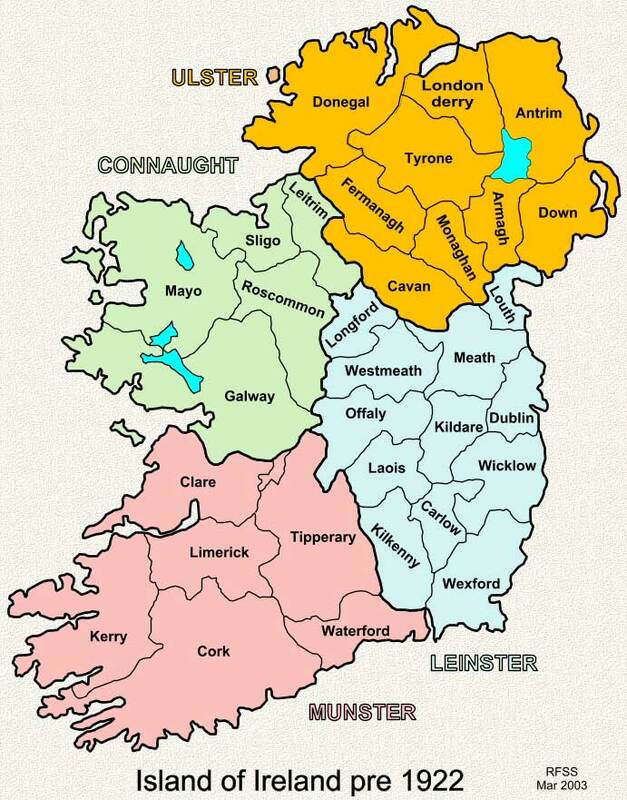 This led to centuries of "troubles", with the Protestant British against the native Irish Catholics. Many records were lost by fire in 1922. The Irish Public Records office in Dublin was located in the western block of the Four Courts Government Buildings and was under attack by IRA militants. Some of the archive records were stuffed into windows and cracks as protection and later burned along with the buildings. The western block had been used as an ammunition store by the Four Courts Garrison, and was the centre of a huge explosion, blowing to pieces one thousand years of Irish state and religious archives. It has been alleged in some quarters that the IRA forces deliberately booby-trapped the Public Record office although the IRA side have always denied this. 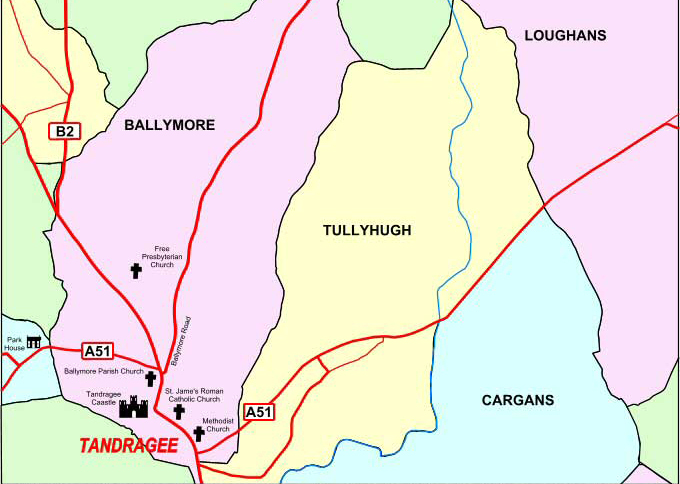 Tandragee is in the county of Armagh (map) about 24 miles from Belfast (map) Surrounding the town of Tandragee there are several "townlands", one of which is called Tullyhugh (or Tullyhue) (map) where many of our Davison ancestors lived. In 1830, there were about 90 tenants of Tullyhugh. Our Davisons were Protestants, belonging to the local Ballymore Church of Ireland (St. Mark's). 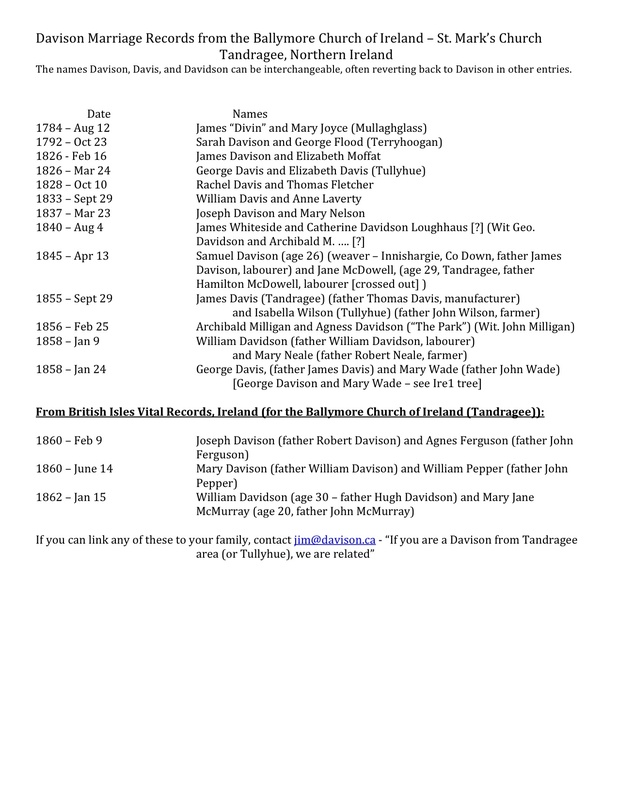 Although our research shows several Davison families in the area over the years since 1690, present day relatives assure us that there has been only one line of Davisons, and "if we are from Tandragee, we are all related". In 1830 in Tullyhugh, we find a James Davison, Joseph Davison and William Davison. All had 8 to 12 acres, with Lord Mandeville as landlord. Joseph Davison owned a house in Tullyhugh, which he leased out. (3). In 1864 in Tullyhugh we find tenants John (inherited from James), George and Ellen, Daniel, Joseph and William Davison. 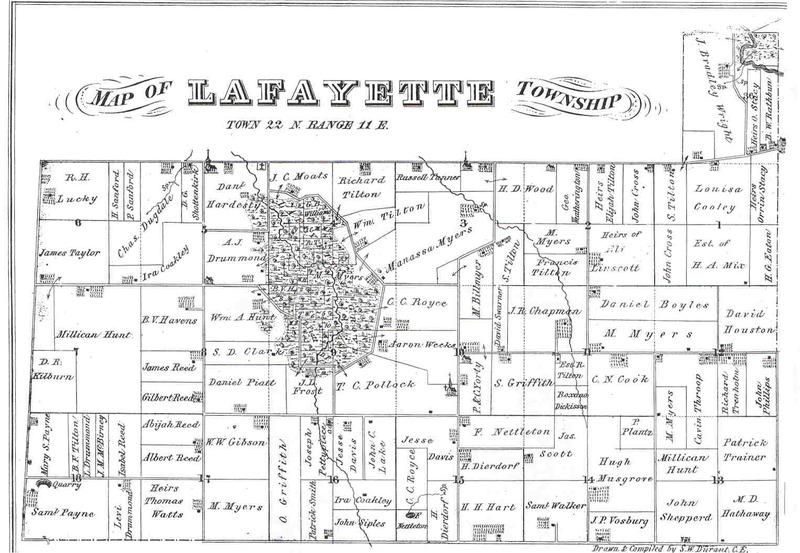 (4) (see 1864 Map). In 1888 we find George Davidson with a farm and residence in Tullyhugh. 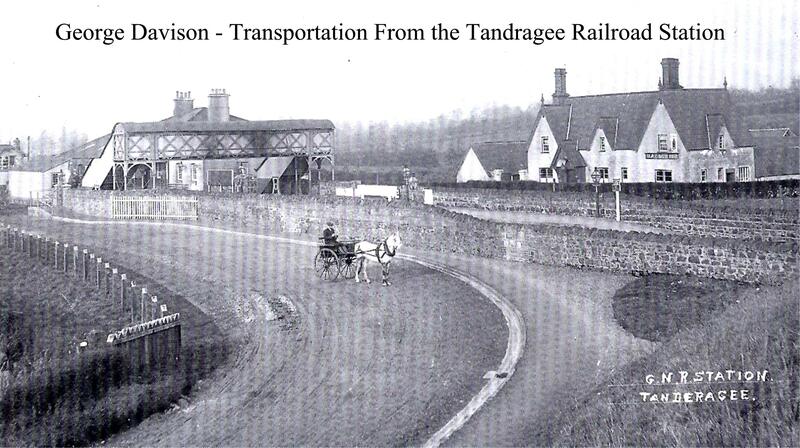 A few miles to the east of Tandragee, in Tullyhugh, was the Tandragee Railway station. Transportation was provided to Tandragee by George Davison "of the Temperence Hotel and Posting House in Market Street, Tandragee". This tradition was carried on at the Davison House, Cobb and Co. Transportation Services, and a Davison relative today continues with his own transportation service (see private family pages). 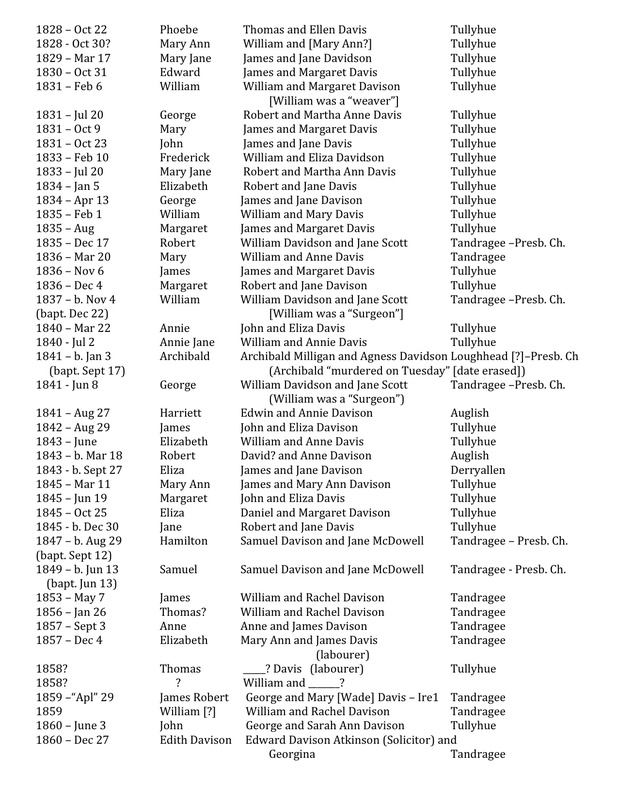 Other research of birth death and marriage church records finds many lines of Davisons. For example, around 1780 we find Edward, Daniel, Jonathan, and William Davison., with children. Around 1835 we find William, James, and Samuel Davison with children. We have linked up George Davison (b. 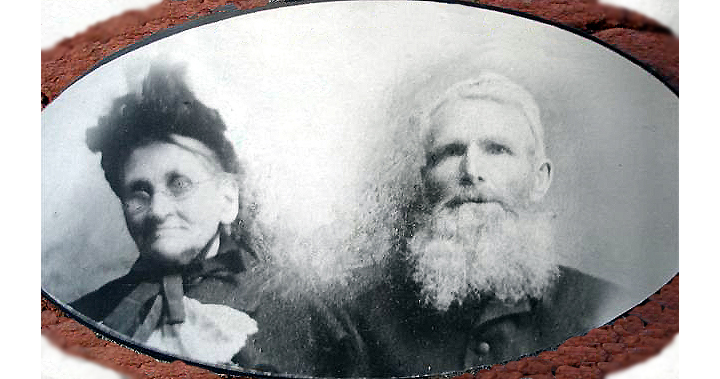 1834) with parents James and Jane Davison. George married Mary Wade, and they are the ancestors of the present day Davisons in Tandragee. It is likely that this is the George Davison in the picture to the left. A great grandson of George (James Robert Davison) left for Australia in 1924, and we are in touch with this present day family (see private family section). We also found William Davison, with wife Margaret and daughter Elizabeth (born 1831). It is possible that this is the William and Margaret Ann who were parents of William Davison (b. 1830). This son William went to New Zealand in 1862 with three children. One infant daughter died at sea and was buried off the Canary Islands on the way. We are in touch with this present day family (see the private family section). 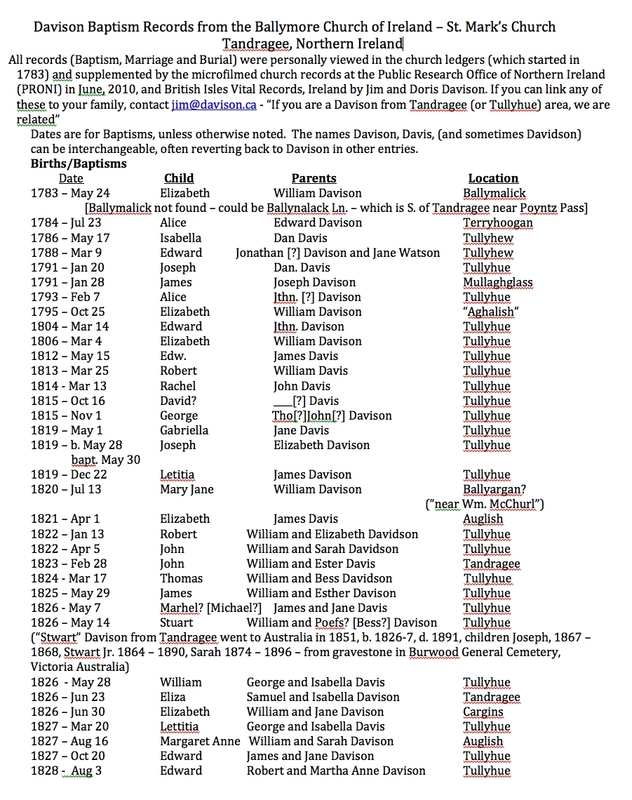 A 2010 search of the original church records (which began in 1783) found over 200 Davison names, which are difficult to organize into family lines. See Church records here: Bapt-1, Bapt-2, Bapt-3, Mar-1, Burial-1. We are appealing to all Davison family and researchers to look at this information and to help sort out the family lines based on factual information. Contact Jim Davison (Canada) - see bottom of page. 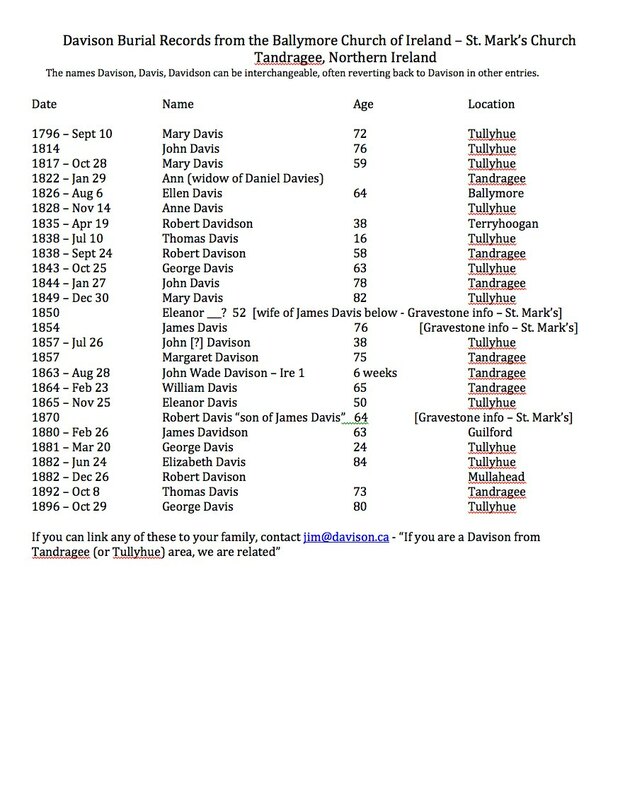 Our Canadian family records and research shows that George Davison left Tandragee about 1826 for Canada. He was born in 1785 and died in 1865 (Ref. 8). 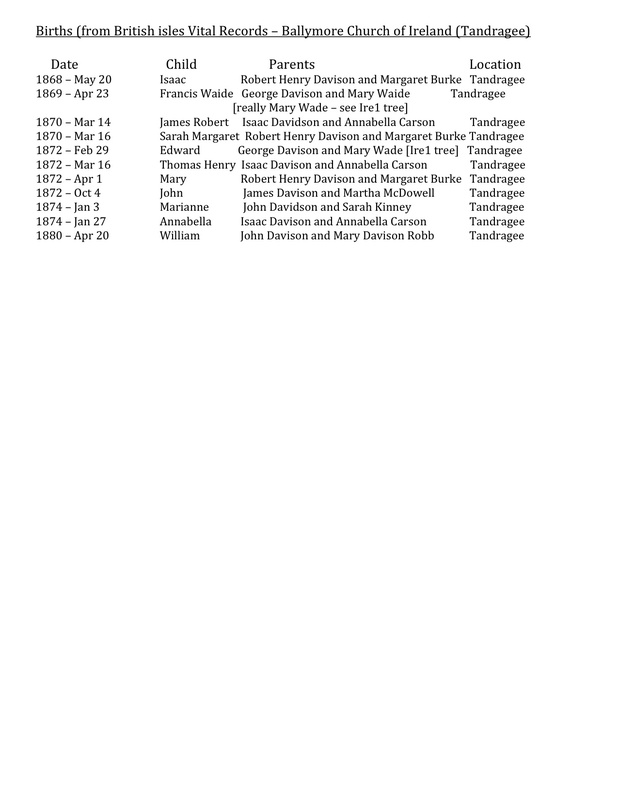 Our family records show that his parents in Tandragee were James Davison, and Mary McLean. The old tree record (picture) that was likely done by my great grandfather (William James Davison) shows James born in 1774, died in 1851. 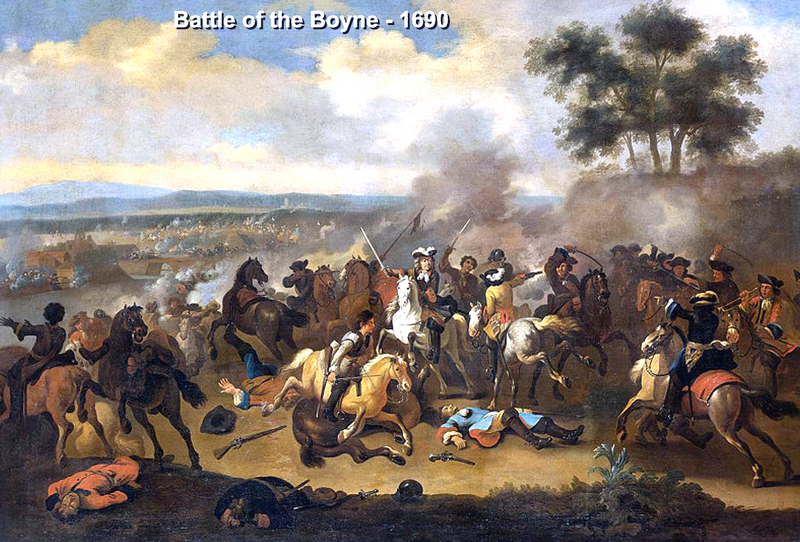 Since we know that son George was born in 1785, it is likely that his father was James who was born before 1765, about 75 years after the Battle of the Boyne. He could be a grandson of the original Davison settler. Around 1826, land in Ireland was becoming scarce. A tenant would agree to name "Lives", meaning those who would continue the lease for life. Typically the oldest son was named. We find a James Davison listed in the 1825 Tullyhue list of landlord Lord Mandeville (picture of original document). The named "Lives" was John Davis (probably Davison). In an 1831 lease document James Davison does name "son John, age 20". James' lease payment was "one days labour with one horse each week, and two fat hens per year". Others listed in 1825 as freeholders were John Davison and William Davison. The other siblings in the family would have to fend for themselves, and many became destitute. 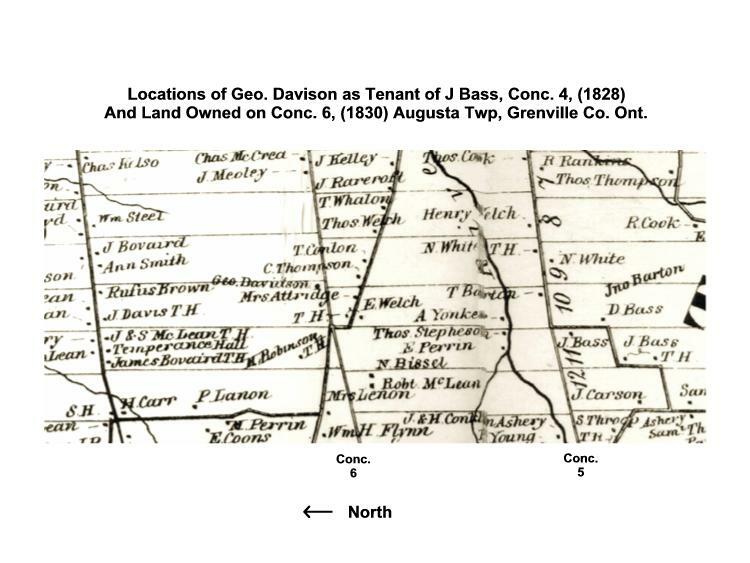 No record is found of our George Davison holding land, or in line to inherit a lease In the mid 1800s. Rather than support those who had no income, the Lords of the estates found it better for all to pay their way to a new country. Many left for Canada, U.S.A., Australia and New Zealand to start a new life ( we have found Tandragee Davison lines in all these countries). George Davison Sr. came to Canada with his wife Rachel McLean in 1826. Since George (and probably Rachel) could not read or write, the spelling of McLean (which was handed down in my family) could be variable. Son Henry took his mother's maiden name when he moved to the U.S.A. and spelled it "McClaine" (we are in touch with the McClaine line). George and Rachel brought their young son George Jr,. age about 5, with them on the voyage. They left behind another son, John, about 15 or 16 years old, who joined George in Canada about 1843. 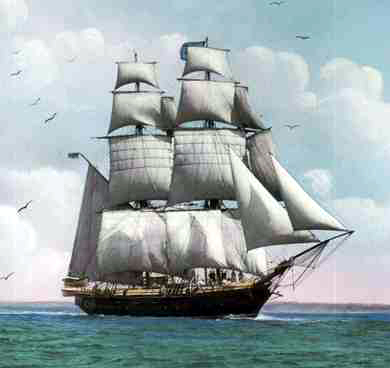 The voyage could take up to three months, and conditions were poor. Many died from starvation and disease. When ships arrived in Quebec, the passengers were quarantined at Grosse Isle, a small island 30 miles downstream from Quebec City. Our family history (Ref. 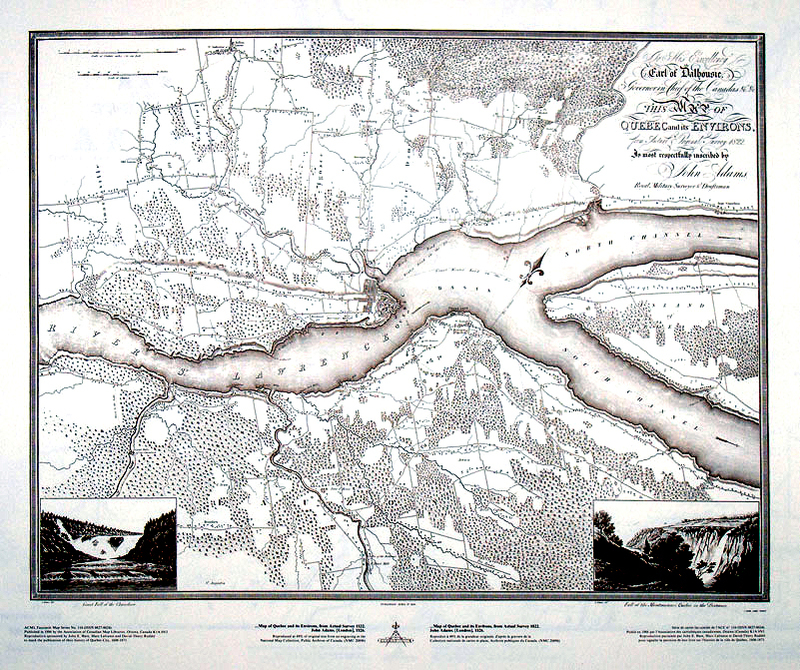 8) tells us that George worked on the battlements of Quebec City when he arrived (see 1826 map of Quebec City). He may have worked for a year or two before moving upriver and settling in Ontario. It is clear that daughter Mary was born in Canada in 1827. 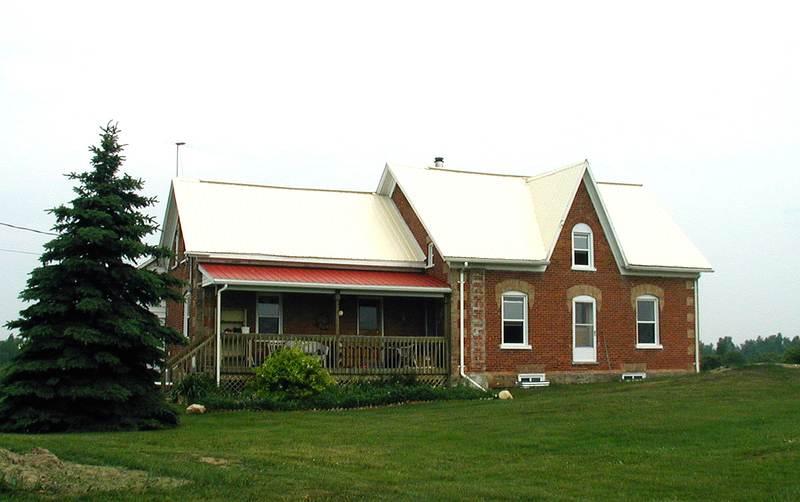 Assessment records show that George and his family first appeared as tenants on the John Bass farm in central Augusta Township, Grenville County Ontario, Canada in 1828. 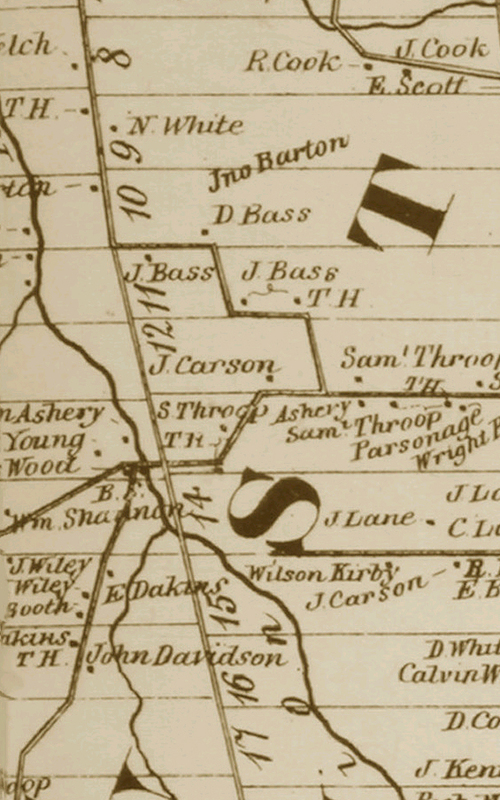 A later map shows the John Bass property on lot 11, fourth Concession, Augusta, with a clearly marked tenant house (T.H.). Land records then show that in 1830, George paid 25 pounds for 50 acres of land on the sixth Concession, lot 9. To this he eventually added land on lot 10, for a total of about 150 acres. George built a log cabin on lot 9, which still stands today (2010). It has been bricked over and is being used as a residence (picture below). Here he raised his family of six children (adult son John did not arrive in Canada until about 1842). The land was not the best for crops, and George and his sons harvested the trees on the property. Driving through the area today shows very few crops grown. The ground is quite rocky, and would be difficult to clear and plow. 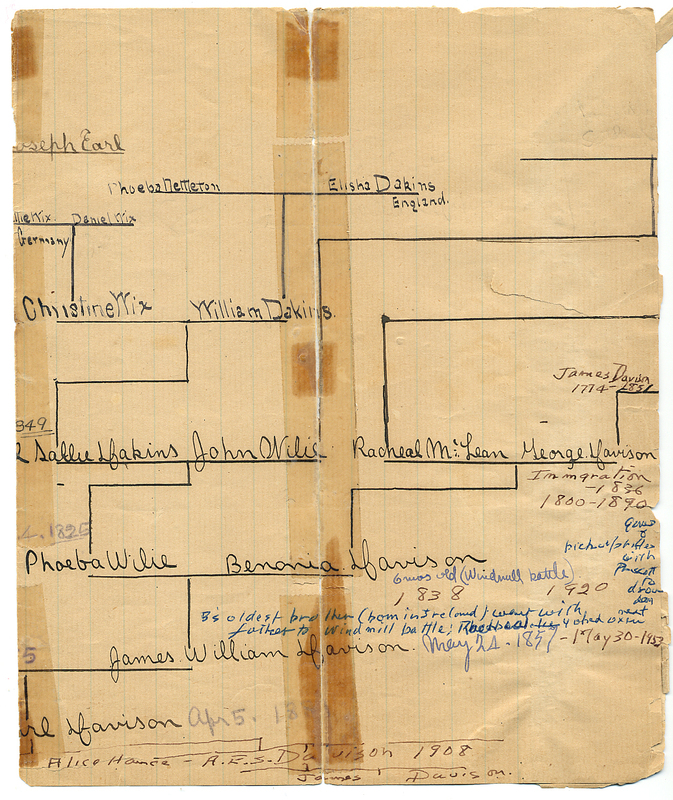 George had seven children, who produced 64 grandchildren (see D1 tree). They spread out over Canada and the USA, and to date we have discovered over 6000 descendants, including related families in Australia and New Zealand. These can be accessed by using the Family Login, above. This is private, for family only. George's will (1864) shows that he named 5 of his children, John, George, Mary, Henry and Justus, each to receive just 5 shillings as an inheritance (see original will here). 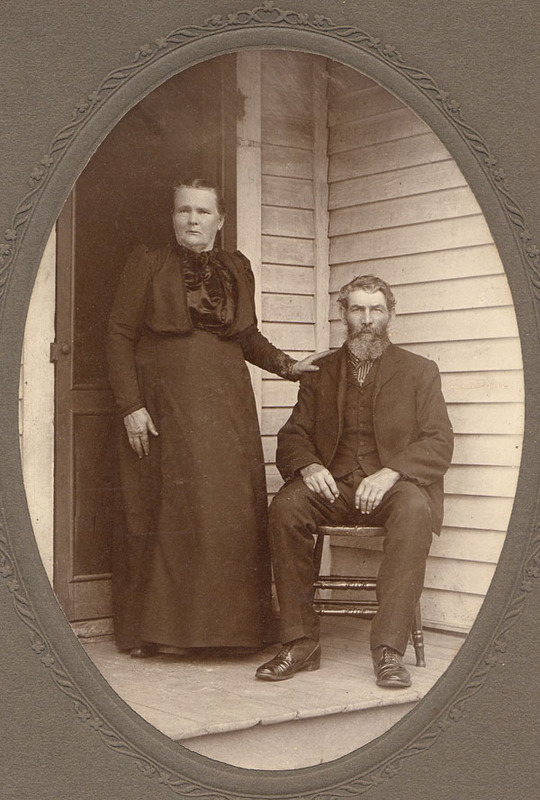 Since only sons Benona and Marcus remained on the property, George willed to "Bennonie" (a nickname, not to be confused with his nephew Benonia or Benoni) 50 acres, along with horses, a wagon and sleigh, a plow and harrow, a circular saw and a set of blacksmith tools. Marcus received the rest of the property. A codicil gave the saw and blacksmith tools to Marcus, and in compensation Benona receives the sum of $89.00. 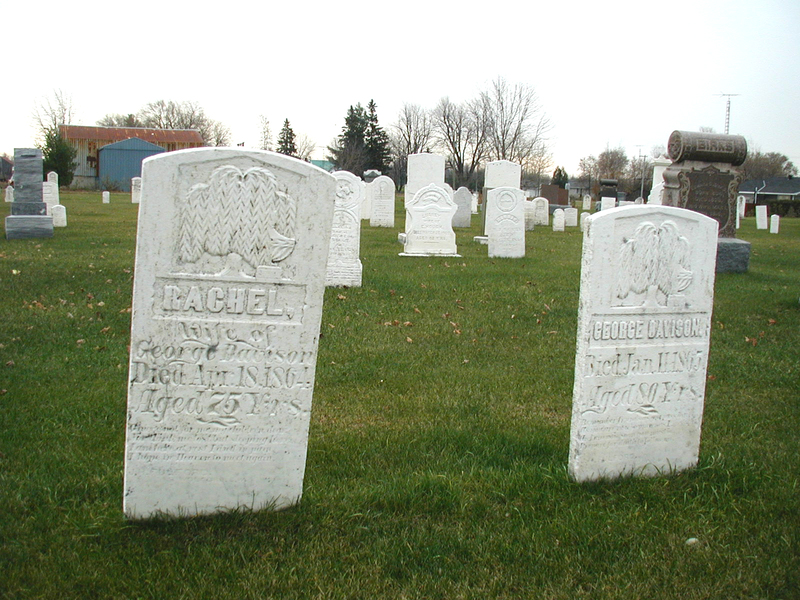 George died on Jan. 11, 1865, a few months after his wife Rachel who died on April 18, 1864. They are buried in the Maynard cemetery, Maynard, Augusta Twp., Grenville Co., Ontario Canada. Many descendants are also buried here (we have identified over 200). 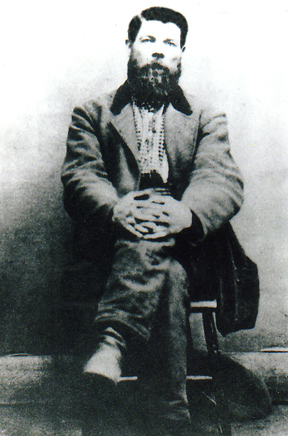 John was born about 1811 in Tandragee, Ireland. He would have been about 15 or 16 years old when he was left behind at the time that George and Rachel emigrated. We speculate that he may have enrolled in the military in Ireland. We first find John Davison in Augusta Twp. in 1842, a tenant with "Mrs. Jessup". In 1844 and 1845, assessment records show that John was a tenant of William Dakins (lot 15, Conc. 5). William Dakins is the father of Abigail Dakins, who became John's wife. Their first child was born in 1845. In 1850 and subsequent years, John Davison owned 6 acres on lot 16, Conc. 5, next to the Dakins farm (map). 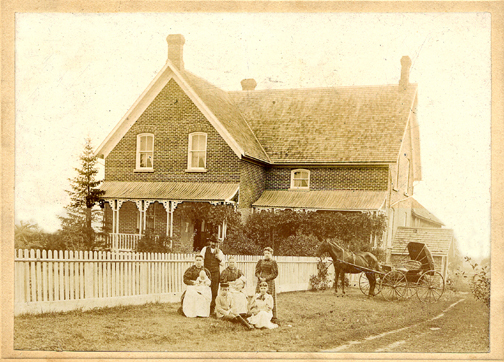 Across the road was the John Wiley farm - he was father of Pheobe Wylie who married John's brother Benona. At this time, John was first listed as a labourer, then as a farmer. John and Abbie had 14 children. In 1848, John had one horse and one cow. He sold his 6 acres in 1870. The 1871 Agricultural returns (Augusta, Div. 2 Conc. 4-5-6) show that John Davison had 23 acres as a tenant, produced 14 cords of wood, and had 1 swine and 1 "milch" cow, producing 25 lbs. of butter. Other occupations are unknown, but research shows there was a tavern owner named John Davison in the town of North Augusta around this time. John changed the spelling of his surname to "Davidson" around 1885, and many of his children followed this. John died at age 92 in 1904, and was likely buried in his wife's grave in Maynard Cemetery. George Jr. owned several lots on Conc. 2, 5 and 6. The 1871 Agricultural Census returns show that George produced 24 cords of wood from 110 acres on Conc. 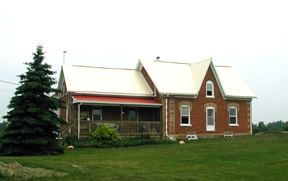 5, with two houses on the property. Present day relatives remember that George's daughter-in-law, Annie Stephenson Davison had said that no one could stand George Davison Jr. and that he was irritable, crabby and very hard to get along with. George left his wife and children, without providing for them. Major family descendants of George Jr. include Baldwin, Stephenson, Johnston and Lafferty. 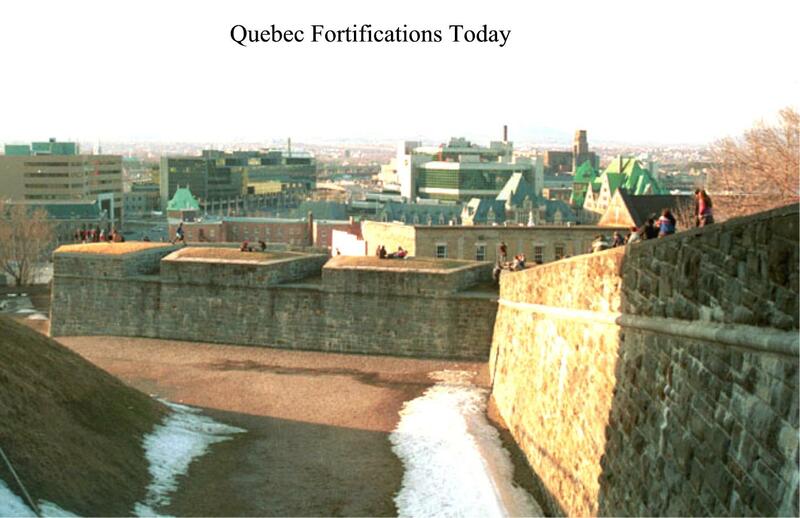 Mary was born in Canada in 1827, possibly in Quebec while her father worked on the Quebec city fortifications. She later married "old John Lavery" (Ref. 7), who was 30 years her senior. Mary's brother George says that John Lavery was from the county of Armagh, where George Sr. was from. The 1848 census lists John Lavery as a pensioner (military? ), living on Conc. 6, Augusta. This is where we find John and Mary, with 3 children in the 1851 census. By 1861, six children were listed. We have been unable to trace Mary and her youngest children after 1861. She may have remarried after husband John died in 1876. We have traced the families of two of her children, William and Robert Lavery, to the present day. Major descendant families of Mary include Lavery, McCartha, Countryman, Worden and King. In 1851, we find Henry living with his sister Mary and John Lavery on Conc. 6, Augusta. Henry married a neighbor girl, Mary Jane Smith. 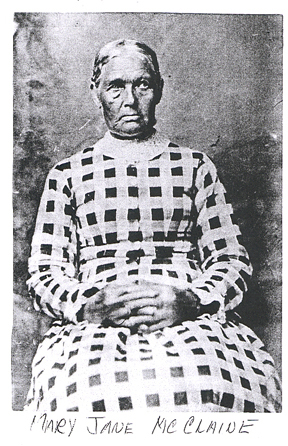 Mary Jane, born in Ireland, was the daughter of Patrick Smith and Mary Ash Smith. Patrick was a widower when he brought Mary and her sister Ann to Canada. Patrick lived at lot 9, Cons. 6 [note that this is the same lot where the original George Davison, Henry's father settled in 1826. 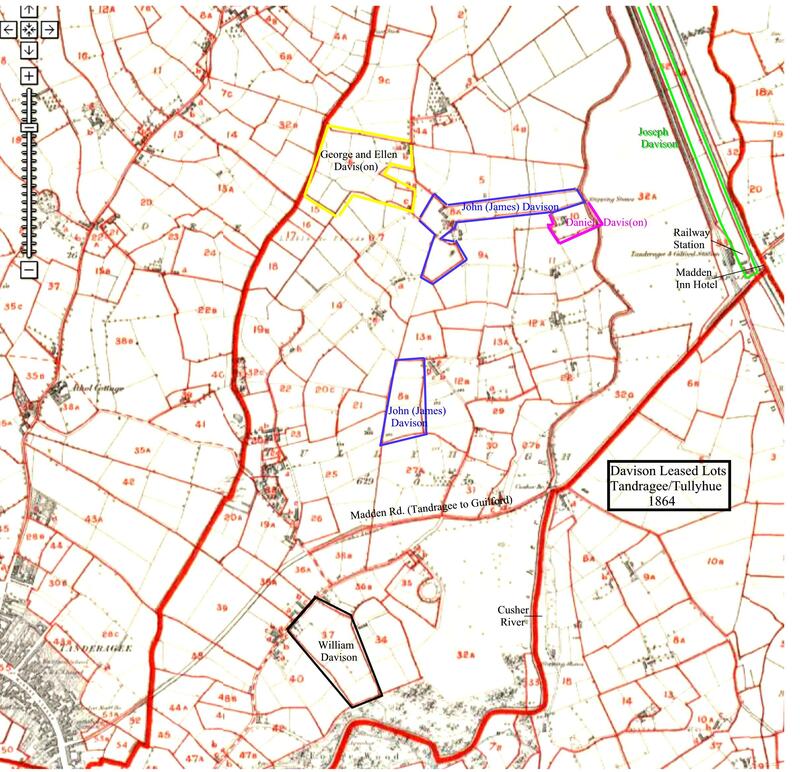 Land maps show that the farms were at opposite ends of the lot]. A family story has it that Henry was involved in a bar fight in Prescott around 1853, and someone was killed. He then fled with wife Mary to the US, taking his mother's maiden name, spelling it "McClaine" (Ref. 8). They purchased 40 acres at Greenbush WI, farming there until 1867, when he sold that land and moved across the state to Eau Galle twp., in St. Croix Co., in west central Wisconsin. In the 1867 plat book , Henry is farming 80 acres, has a log house on a hill, with acres of hardwood trees that supply his saw mill. Henry had two baby girls who died, and are buried on the farm (Ref. 9). 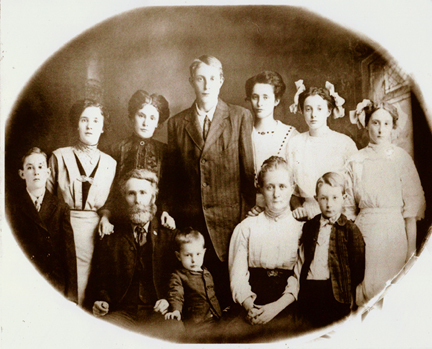 Henry and Mary had six surviving children. Ann Amick (Henry's great great granddaughter) relates how Henry's origins were discovered. A family story was passed on about Benona Davison, brother of Henry, who made the journey by wagon with a sister of Mary Smith to visit in Wisconsin. Benona was from Augusta, Grenville Co., Ontario. Ann made the visit to the local Augusta archives and researched the Davison origins of her family (Ref. 9) and found that Henry was born a Davison. Henry died in 1899 and is buried in Brookville WI. Major descendant families include Amick, Browe, Holman and McClaine. There are various spellings of this given name, at first in the censuses as "Justice", then later Justus. It appears that he was known as "Jesse" or "Jessie". Justus married Mary Jane Knight in Augusta Ontario, and had two children before moving to the USA about 1857. His two year old, James, had flaming red hair. As Justus and family moved through Indian territory, they were noticed, because red hair was a symbol of good luck. The Indians offered five horses for the baby. The offer was politely refused, and the family continued to Illinois in search of good farm land. A map of the time shows the two farms that "Jesse Davis" eventually purchased. (See 1872 map and present day map). These farms were just north of Ashton Illinois on Highway #38. Justus died in 1905 at the age of 78 - " Broke his neck falling off load of straw to the ground". Major descendant families of Justus include Davison, Ludwig, Hendrickson, Primrose, Ross and Rose. Marcus, along with brother Benona, inherited the family farm. In addition, Marcus owned saw mills and a flour mill on the Six Nation River. He owned and ran a shingle mill on lots 9 and 10, Cons. 6, Augusta (the original homesite). It ran for six months a year and employed 5 men and 3 boys with total yearly wages $1000. He produced 500 cords of shinglewood, and 1750 sawed shingles for a value of $4750. He also produced 100 cu. ft. of squared timber and 600 standard logs. The power used was steam. The Agricultural Returns of the 1871 census shows that Marcus had 190 acres of lot 9, of which only 45 were improved (thus the potential for forest products). Ten acres were pasture, 1 acre was garden and orchard, and 8 acres of hay, producing 6 tons of hay. He also had 4 "milch" cows producing 350 lbs. of butter, 2 horses, 2 oxen, 3 swine, 4 sheep and 3 beehives. His part of the lot produced 120 bushels of oats and 220 bushels of potatoes. There were three dwellings on the land, with 4 barns and stables, one warehouse, 3 carriages and/or sleighs, 1 wagon, 2 plows. Marcus married Mary Whitley, and they had 12 children. His line is one of the few to carry on the Davison name today, with "Marcus" or "Mark" appearing in each generation. He died in 1909, and is buried in Maynard Cemetery, in a plot beside his brother Benona. Major descendant families of Marcus include Davison, Gill, Klingbeil and Phillips. Benona was the last-born of George Sr. He was known to close family as "Bennonie", which gives some confusion with the name of his nephew "Benonia", known as "Benoni". Benona married Phoebe Wylie, and stayed in the family homestead to raise his children, thirteen in all. Pheobe was the daughter of the well-known John "Jock" Wylie, who arrived in Canada from Scotland not too many years before "with kilts a-flying" (Ref. 8). In Canada he married Sarah Dakins, and we have traced the Dakins family back to the 1500s in England. "By the late 1800s Benona's son Wm. James (my father) purchased land, from which all the trees had been removed [common in the area]. The farms attempted to compete with crops of barley and hops for a small trade which had opened across the nearby [US] border. This trade was stopped quite suddenly with US trade barriers. Hops poles were burned for fuel. The author at age 10 (1891) recalls seeing the last 10 acre field cleared of stumps (and lamenting the loss of the bluebirds each spring). The sandy soil became eroded by water and wind. I decided that farming was not for me." Arthur Davison went on to be the Chief Engineer for Ontario Hydro, constructing most of the initial power lines across the province, as well as the Sir Adam Beck power station at Niagara Falls, Ont. His father, Wm. James, became a teamster, carpenter and house builder in Prescott and Niagara Falls, Ont. He farmed successfully in Saskatchewan from 1911 to 1926. Benona continued to farm the homestead, but in 1900 moved to Ogdensburg, NY as a market gardener. The homestead in Augusta was abandoned, and was eventually sold for taxes. He died in Ogdensburg at age 85, and was buried in the Maynard Ont. cemetery. 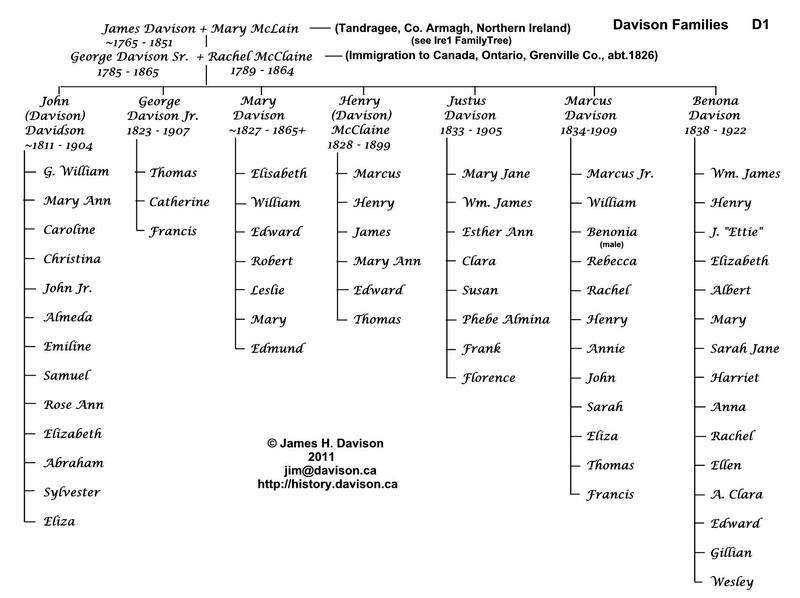 Major descendant families include Black, Davison, Davidson, Earl, Hallada, Henry, Hough, Kelly, Kelley, Martin, and Moran. 2. Samuel Lewis: Topographical Dictionary of Ireland, S. LEWIS & Co. 87 ALDERSGATE STREET, 1937. 3. Tithe Applotment Books, Tullyhue, Church of Ireland, 1830. 5. 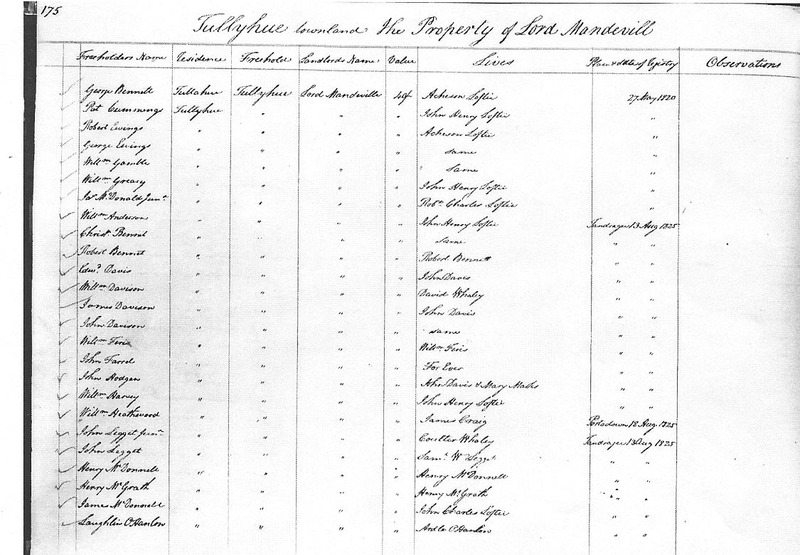 Ordinance Survey Documants, Royal Irish Army, List of emigrants from Londonderry Parishes, 1833 - 1836. 7. Interview notes with George Davison Jr. in the F. J. French Collection, circa 1891 - Grenville Historical Society, Prescott Ontario. 9. Notes from Ann Amick, Henry Davison McClaine's great great granddaughter. (replacing the brackets with the "at" symbol).